• To enter Russian Academy of Sciences Presidium, all participants (non-Russian and Russian) need to show your passport. Ulaanbaatar, Mongolia, from June 24 (Sat) to 25th (Sun). The meeting was co-hosted by RECNA and Blue Banner with special cooperation from Asia Pacific Leadership Network for Nuclear Non-Proliferation and Disarmament (APLN). (RECNA) is responsible for its contents. This is the second PSNA workshop and it will be held in Ulaanbaatar, Mongolia, with collaboration with Blue Banner and APLN. The main objectives of the workshop is to review critical issues identified by the previous workshop and discuss current topics in order to enhance mutual understanding of regional security issues in Northeast Asia. This time, we plan to issue Co-Chairs’ policy statement and summarize the discussion for future reference. The workshop will be done under the Chatham House Rule. Now a few months have passed since the Trump Administration is in power. This session is intended to assess implications of new US nuclear policies under the Trump Administration to the security of Northeast Asia, including possible responses of other nuclear weapon countries in the region. This session will focus on the recent new developments in global nuclear disarmament efforts, especially on the negotiation for legal instruments to prohibit nuclear weapons at the UN and its possible impacts on the NPT review process. This session is intended to focus on future of Northeast Asia Nuclear Weapon Free Zone Treaty, and its possible contribution to regional security issues and ways to initiate . 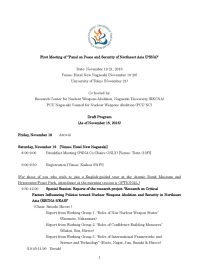 This session will focus on key policy issues associated with civilian nuclear programs in Northeast Asia and its implications for peace and security of the region, including possible regional framework and cooperation in nuclear fuel cycle activities. This session will summarize the discussion of this workshop and discuss future next steps for PSNA and plan for the next year’s meeting. 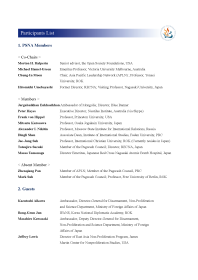 ＿ This is the participants list of the First Meeting of “Panel on peace and Security of Northeast Asia (PSNA)” which was held in Nagasaki and Tokyo, Japan. 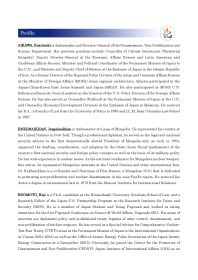 ＿ This is the profiles of participants in the First Meeting of “Panel on peace and Security of Northeast Asia (PSNA)” which was held in Nagasaki and Tokyo, Japan.